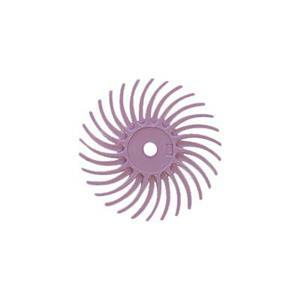 The pink pumice 3M Radial Bristle Disk is a medium grit that is made for semi-finishing and pre-polishing. We carry the whole selection of 3M radial disks in our jewelry polishing supplies section on our website. Please refer to our 3M Radial Bristle Disk Chart for additional information on the different disks available and the use of each disk in the finishing process. Feel free to download this chart for your studio. Notes: Recommended speed 15,000RPM to 30,000RPM. I love this gentle polishing bristle. I use it along with the other grits of the 3M Radial bristles for an easier polishing experiencce. Put more than one of these (I use 3) on a mandrel (https://www.halsteadbead.com/x275) for a wider coverage. Highly recommend, just be sure to put the bristles on turning in the correct direction.